It's been 19 years since the Mel Gibson/Helen Hunt snoozefest WHAT WOMEN WANT hit theaters. Now, we have a gender-flipped version of the film that is just as uninteresting as the first. 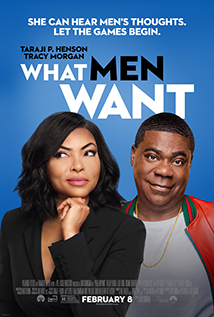 The biggest problem with the movie is how unlikable Taraji P. Henson's character is. She doesn't have a character arc. She has a flat line with a spike in the last 10 minutes. Her character is mean, obnoxious, and stubborn in every aspect of her life. And even though there is plenty of opportunity for her to get it and start to change along the way, she never does until the very end when it all hits at once. I mean, come on, even Scrooge started to realize the error of his ways in the middle of A CHRISTMAS STORY. Josh Brener and Aldis Hodge are fun to watch. They give the movie some much needed warmth and compassion. The rest of the cast does a decent job of moving the story forward, but nobody steals the show. The movie does have a few laughs, but that is about it. Even though it is formulaic, it never hots the emotional tones that is should. This is mainly due to Henson's character being so self-serving. It even got to the point when she was having problems with her boyfriend that I was rooting for the guy to leave her for good. I can't recommend paying money to see this movie. If you really want to see it, just wait until it comes out digitally. There is nothing in the movie that makes it necessary to see it on the big screen, so save yourself a few bucks and see it in a couple of months.